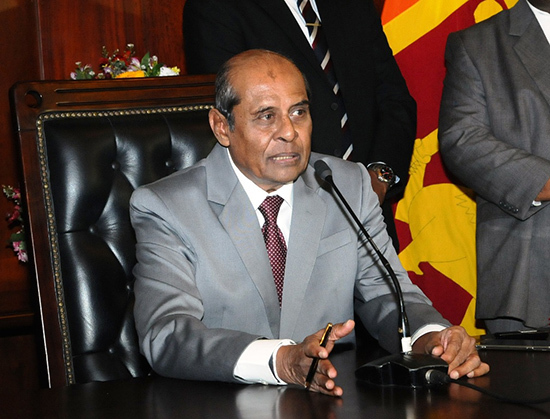 Colombo, March 20 (newsin.asia): In his speech at the UN Human Rights Council (UNHRC) in Geneva on Wednesday, the Sri Lankan Foreign Minister, Tilak Marapana, categorically denied that the Sri Lankan armed forces had committed war crimes. He also clearly stated that it is not possible to establish a hybrid judicial mechanism with foreign and Sri Lankan judges to try cases of alleged war crimes as demanded by the UNHRC resolutions of 2015 and 2017. Marapana went on to point out to inaccuracies and impermissible innuendos in the speech of the High Commissioner for Human Rights, Michelle Bachelet, and the double standards applied to the Sri Lankan government and its detractors. It is an injustice to deprive any serving or retired officer of the Sri Lankan security forces or the police of their rights,” he added. Giving details, he said: Of the 71,172.56 acres of State lands held by the Security Forces, since May 2009, 63,257.48 acres have been released, as on 12thMarch 2019, i.e. a release of 88.87% of land originally held. Of the 28,215.29 acres of the private land held by the Security Forces since May 2009, 26,005.17 acres (92.16%) have been released. The remaining lands, which are a necessity in the context of national security, would continue to be held by the security forces, with compensation being paid in respect of privately owned lands,” he added. The Minister pointed to the considerable unevenness in the standards of proof applied to the Government of Sri Lanka, compared to those applied to the unsubstantiated allegations made by Sri Lanka’s detractors. This is problematic and confounding,” he remarked. At the same time when evidence surfaces, which contests the culpability of the Sri Lankan security forces and police in having deliberately caused civilian casualties during the last phase of the conflict, this evidence is summarily disregarded,” he pointed out. With regard to the allegation that the former war zone is lacking in infrastructure”, the Minister said that 66,100 houses have been constructed and handed over in the North and East to civilians during the period 2009 to 2018. In 2019, work commenced, on the construction of 4,750 houses on an owner driven model”. It is anticipated that this program would be completed by June 2019. The Prime Minister has taken keen interest to see to the progress of the development in the North and East, Marapana said. On the PM’s recommendation, a program to construct 10,000 houses has commenced. Other infrastructure development projects that have taken place since 2015 are: Livelihood Assistance – 23,548 families (Rs. 100,000/- per family); No: of domestic common wells – 1,817 nos; No: of Water Connections – 10,245 families (Rs. 25,000/- per family); Electricity Supply – 14,374 families; Internal Roads – 254 no; No: of Sanitation facilities – 14,238 families (Rs.60,000/- per family); Hospitals/Health Centers – 56 nos, the Minister said. In conclusion, the Lankan Foreign Minister assured the UNHRC that based on the above parameters, Sri Lanka will continue to work with the Office of the High Commissioner for Human Rights, and other partners. It is not clear as to what form the resolution to be passed on Thursday will take. What is abundantly clear is that Sri Lanka will only implement what it can taking into account political, legal and constitutional factors. The UNHRC is an arm of the UN. The UN is functioning on the funds (payments) largely made by the US and the western nations. Therefore the UNHRC has to do the job as they have been ordered by their paymasters. How could we expect an impartial report from them? This is a much better approach than what the Fat Samarasinghe did during MR’s government. This approach by a member of Yahap team is unbelievable. Great work Mr. Marapana unlike your predecessor Mangala, who simply accepted what UN said. The Fat Samarasinghe is 100% responsible for the mess in which Mother Lanka is in today. MR was relaxing and sleeping by giving the responsibility to handle UN to a fool like him. The capable hands of GR were busy developing the cities and creating foot paths. If he was given this matter to handle, it could have solved at the root level. Now it has grown to a gigantic Tree. The main influence for this change is mostly the spirit and the fighting back of our patriots at Geneva. Admiral Sarath Weerasekara stays on top of the list and other academics and GSLF should be commended for the service they did for Mother Lanka at Geneva. In addition, the patriotic journalists and writers who worked tirelessly has made the public knowledgeable of the dangers and the real issue and due to that, the Yahaps could not dance to the tune of the West any longer and keep on saying that the people who complain about UNHCR see crocodiles in the tea cup. People know that this is a real killer crocodile and Yahaps are now aware of it. Still, a long way to go because the LieTTE rump are working tirelessly and spending lavishly to promote their Ealam dream. We should only relax once this cancer is 100% removed from body of Mother Lanka. As patriots we must not play politics with national security. We must commend anyone who does good for the country and condemn anyone who does the opposite. Tilak Marapone is a senior lawyer and he knows what he is doing. Thank you Tilak for doing the right thing. Mentioning of Mangala is also interesting. During the CFA time Sri Lankan navy ships were attacked and destroyed by LTTE as our navy was told not to attack them. However, at some point Sri Lanka had enough and started attacking Tamil terrorists and their boats and ships under the UNF regime. LTTE weapons transport ships were bombed by the airforce and sunk them. Tilak was the defence minister. It was done under his instructions. However, Mangala (then in the opposition) claimed it was done under Chandrika’s instructions! The confusion ended when Chandrika and Mangala had their own government in 2004. No LTTE ship was attacked during this time! Absolutely none. Patriots must keep their eyes and ears open always. Those who claim to be patriots are not so patriotic after all and those branded as traitors are not as threcherous after all. Each event must be judged seperately. There are no all time patriots in political clans. Never. It seems this is the only time it is being done properly. Sam-Mara-Singhe is a traitor.